H & S Bloodborne Pathogen Kits are made from high quality materials and are perfect for municipalities, industry and emergency responders. They come in cases of 12 and may be purchased in bulk quantities. 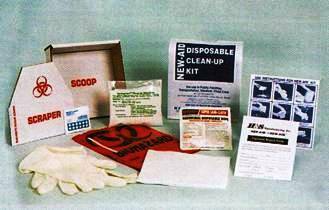 H & S bloodborne pathogen kits come in a variety of sizes for the clean-up of body fluids such as blood, urine, feces and vomit and other potentially infectious substances. They will help you comply with OSHA's 29CFR Part 1910.1030 Occupational Exposure to Bloodborne Pathogens Final Rule. They are comprised of Hep-Aid Bodily Fluid Disposal Kits, Hep-Aid Disposable Vomitus Clean-Up Kits, New-Aid and New-Aid Plus Disposable Clean-Up Kits, Responder Kits With CPR Protector, Rodent Waste Protection Clean-Up Kits, Springtime Clean-Up Absorbent, Hypo-Chlor Absorb-Up and even a Teacher's Helper Kit. Everything is in stock and ready to ship immediately.